Edit 2/1/2011: updated with the latest mcmap, which adds support for new block types (dyed wool, music blocks, etc). Edit 2/24/2011: updated with the latest mcmap, which adds support for the new Minecraft beta v1.3 map format. Edit 3/6/2011: updated with the latest mcmap and Minecraft Biome Extractor, which have added support for biome rendering in the new Minecraft beta v1.3 map format. Requires the Microsoft .NET Framework 4 Client Profile. Just Download, unzip, and run minemapper.exe. Please note, I've changed where I'm hosting this project, and I've uploaded the source. I was inspired by the work of Donkey Kong on MCMap Live, but since I don't have a mac, I set out to create a similar app for Windows. I used the excellent mcmap command-line mapping tool created by Zahl. Minemapper determines the total map size, then quickly generate virtual tiles for the entire map. Then, in the background, it uses mcmap to generate small map tile images, loading them in on the fly, similar to Google Maps. You can pan by dragging with the mouse, and zoom by using the mouse wheel. You can also zoom to selection by holding Ctrl and dragging a rectangle. I've added support for Minecraft Biome Extractor to show biome colors. Many thanks to these guys for all their hard work! I've also added rudimentary support for the height slicing that mcmap provides. It's slow the first time you adjust the height for a tile, but after that the image is cached and you can just hold down the buttons to increase or decrease height and it will go extremely quickly. I added support for cave and nether modes in v0.1.2, as well as manual slice height entry, better image caching, etc. Let me know what you think, or if you have any problems. Great, glad to hear you like it. Yeah, I noticed the same issue when zooming with the mouse wheel. I'll see if I can get that fixed. Looks interesting, will give this a try later. LOVE THIS! Much faster than cartographer... but is there a way to remove chunks to see whats inside or alter the transparency of chunks? Thanks a bunch for this little tool! Thanks for the feedback, guys. I'll see if I can add a way to change the transparency of the chunks. @Obsidian_ no source yet, but I'll post here when there's an update. I definitely plan to add all the features that mcmap exposes (slicing, directions, biome support, etc). I just posted an update, fixed the issue when zooming where the view would 'jump'. Did it crash right when you started it? Did you get an error message you can post or send me? Do you have the Microsoft .NET Framework 4 Client Profile installed? It crashes for me now whenever I try to click on the map (to drag my view around). 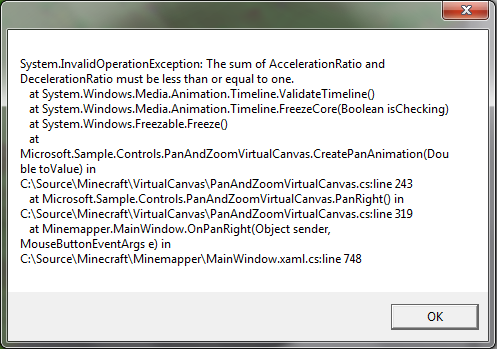 There was no useful error onscreen, just "Minemapper has stopped working." This happens whether or not I have loaded a map into the program. I have Windows 7 32bit and .NET 4.0 installed. Also, the last version of minemapper worked for me. Thanks for the bug reports, guys. I've updated Minemapper. System.InvalidOperationException: The sum of AccelerationRatio and DecelerationRatio must be less than or equal to one. repeated over and over again with different coordinates/times or whatever those numbers are on the last line ('12,788'). Thanks for the info, sorry for the problems. I can't recreate the issue, but I've made a change and updated Minemapper, mind downloading and trying again? You can delete the log, if it gets too big. I'll add an option to keep the log below a reasonable size limit later. Thanks, I added the navigation controls after I made a change that I hoped would take care of the panning error. Sorry you're still getting the error, I cannot think of how to reproduce it. Is anyone else having the same problem? Have you/can you try it on another machine, see if you get the same error? Does it happen on all worlds? Can you zip one up and send it to me? I think I have a few more things to try to fix the problem, I'll get you a new build later tonight. Thanks again for your help in trying to fix the problem. Alright, I've posted an update, please try again, let me know if it still happens. I've also fixed a problem where as soon as you zoom with the mouse wheel, the zoom control buttons and slider stopped working. Awesome! :biggrin.gif: It's definitely working a lot better now. I can move around and everything like that. 1) If you attempt to zoom while you are dragging your view around, the view moves funny. Not a big error, but still thought I should mention it. 2) I think the zoom slider's values should be tweaked, and the default should be in the middle of the slider. Right now it seems that if you use the slider, you can only go from a normal zoomed-out value to a ridiculously close zoomed-in value. Great news, glad to hear it. Sorry it took so long, thanks for all your help. I still could never reproduce the issue, but I think it's an internal problem with WPF and .NET. I'm going to forward it on to Microsoft. I'll see what I can do about the zooming while panning issue. Yeah, the current range on the zoom slider is 50% to 2,500%. I'll probably adjust it to something like 12.5% to 800%. Note that there are no limits in either direction when zooming with the mouse wheel. I will likely be adding other pan and zoom gestures, like double-click to zoom, etc. Biomes work here, I've tried it on two different machines. You should see Donkey Kong's Minecraft Biome Extractor pop up. I'll probably hide the window later. If not, make sure the java bin folder is in your PATH environment variable (I think the Java installer puts it there by default). You can also manually run the MinecraftBiomeExtractor.jar on your world first. See the Minecraft Biome Extractor topic for more information.